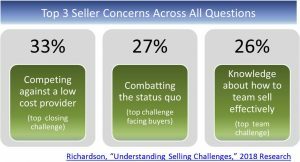 Understanding Sales Challenges, Richardson’s recently compiled survey, identified the top 3 concerns among seller executives: (1) Competing against a low cost provider, (2) Combatting the status quo and (3) Knowledge about how to team sell effectively. These concerns are consistent with 2017’s results and are problems for B2B sales teams working their way through all stages of their sales cycles. But there is a point early in the sales cycle when the second problem, combatting the status quo, is the dominant problem for sales. This is a lonely time for a sales rep. It is the time when a sales rep is working to connect with a new prospect and to develop that prospect into a qualified opportunity. It is the time when buyers are using the abundant digital information available to identify potential change and prioritize its evaluation, without any perceived need for human contact. The goal for sales during this stage of the sales cycle is to get real buyers with budget and need beyond an initial high-level assessment to commit the time and energy it takes to evaluate a new solution. The prospect can’t assemble the right buying team to consider a purchase. Buyer sponsors don’t have a problem the seller can solve or perceive an opportunity the seller can help them with. The time is wrong for the buyer to evaluate the seller’s solution. Objectives Early in the Sales Cycle. Sellers who have the right conversations with buyer sponsors, champions and decision-makers in the Identify & Prioritize stage have an advantage. Early sales connection helps a buyer overcome the forces of inertia, helps to influence the buyer as they formulate objectives of an evaluation and helps the buyer to identify the right team and the right sponsor for the evaluation. Connect. Is a buyer willing to engage? Does the buyer believe that you understand his or her business well enough to help? Qualify. Is your prospect an effective sponsor, champion or buying mobilizer? 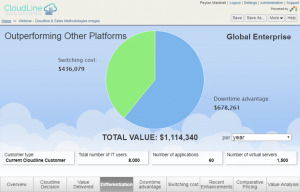 Does your solution fit the buyer’s currently identified needs or objectives? Differentiate. What does your solution do for the buyer? Is spending organizational bandwidth on your solution a good use of time relative to the alternatives that the buyer could be considering? Advance to the Next Stage. Keep it simple. Full proof of your solution’s performance early in the sales cycle is rarely required to get a buyer to evaluate your solution. Make it easy for the buyer to take next steps. Move the ball down the field. Value Propositions Early in the Sales Cycle. There is a common misperception that Value Propositions are only useful in the middle to later stages of a sales cycle. This is partly because most financial Value Propositions are designed as complicated spreadsheets by authors who want to prove that every assumption is reasonable and every calculation is right. It should come as no surprise that these spreadsheets are viewed as too difficult for the average rep to understand or present. But this misperception is not inherently a sales personnel or sales training problem. It is a Value Proposition design problem. Often enough, Value Propositions are not constructed with enough flexibility for how your sales teams have conversations. They need to be able to articulate your Value Proposition not just in financial terms, but also in quantitative and qualitative terms. For effective use early in the sales cycle, Value Propositions should be designed as Flexible Case Studies. Of all the collateral that marketing teams create for sales, case studies are the best suited to address the primary objectives of sales reps early in the sales cycle. Case studies answer the question “what do you do for your customer?” They are especially relevant if the customer portrayed is similar to the prospect, but they are broadly useful because they are inherently customer-centric. Case studies, whether naming a specific customer or preserving a customer’s anonymity, provide concrete information about what you did for another customer and the benefits your product or solution provided to that customer. The best case studies highlight how your product is better, how much better you are and what that means economically for your customer. Yet most case studies aren’t used by sales in customer conversations. Typically case studies are designed as static content. Case study pdfs are most often sent to the customer as post-call follow-up where they generally languish in a prospect’s inbox. Case studies, when made flexible, are a natural way for sales to have a value conversation with a customer early in the sales cycle. Early value conversations have a real payoff. Buyer surveys show that the first seller to turn a vision into a clear path to value wins the business 74% of the time. For account executives and sales reps, Value Propositions in the form of Flexible Case Studies are useful early in the sales cycle in call preparation, in building sales confidence, in qualifying opportunities and in engaging customer executives. 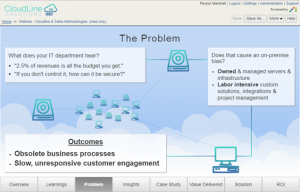 When well designed, a Flexible Case Study can follow the deal through the sales cycle, making a transition to a Customer Value Analysis when the buyer is evaluating your solution so that a buyer sponsor shares a Business Case to buy as they get internal approvals and negotiate in the Decide & Purchase stage. In a future blog we will explore the use of Value Propositions in the middle of the sales cycle, but the best reps realize that leaving their Value Proposition until that late creates risk in the sales process. As SiriusDecisions’ research indicates, the number one problem for sales effectiveness is an inability for sales teams to convey their Value Proposition. Once a customer is evaluating your solution, technical details often become central to customer conversations, dominating meeting questions and customer air time. Even the best technical experts, subject matter experts and solution consultants can get bogged down in complexities, which results in your Value Proposition receiving inadequate focus in the middle of the sales cycle as customers Evaluate your solution. Flexible Case Studies are a good way to get the value conversation underway early. How Reps Use Flexible Case Studies/Value Propositions Early in the Sales Cycle. Let’s look at how Value Propositions are used early in achieving each of the four objectives identified. 1. Connect. Later in the sales cycle, a well-designed Value Proposition supports a direct conversation about what your solution will do for the buyer. 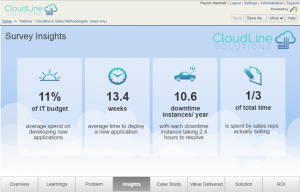 Early in the sales cycle, a Flexible Case Study starts that conversation in a more subtle way. By telling the story of what your solution has done for another, similar customer, a Flexible Case Study invites the buyer to picture what your solution can do for them. Flexible Case Studies, as emerging Value Propositions, are customer-centric by their nature. You understand the buyer’s problems. 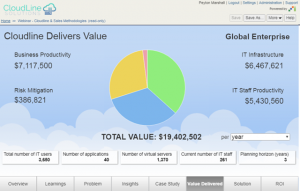 A good case study illustrates how your team has solved another customer’s problems. Those “other customer” problems become a natural basis for questions that get the buyer talking about their problems. You understand the buyer’s business. 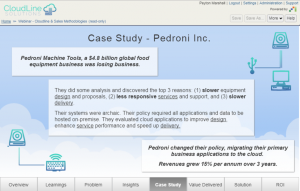 A well-designed case study illustrates how your solution delivered results to another customer. While some of these results may be qualitative in nature, quantitative and financial results delivered to the case-study-customer strengthen the case. If the case study explains how your solution delivered business results to others, it provides clear evidence that your organization successfully understood the case-study-customer’s business. A case study becomes an invitation to relate the other customer’s business to the buyer’s business. It starts with a few basic business parameters for the case-study-customer that draws the new buyer into a discussion of their business, its scale and its problems. The buyer can trust you. There is a point where the flexibility of the case study is crucial. It is that point where you have drawn a buyer’s interest and perhaps a buyer’s curiosity. The buyer is ready to be forthcoming about what their problems are. The buyer may be ready to provide some qualitative and quantitative information about their Doing background research on the customer before the call is always useful, but a case study with benchmark data provides an additional way to have a buyer-relevant conversation without having perfect information and without doing as much homework. Modifying the Flexible Case Study to shift it toward a more specific customer Value Analysis, whether qualitatively or quantitatively, is a big step in developing trust in the relationship. You get to the point. A well-designed Value Proposition supports simple answers to key buyer questions. What does your solution do for me? What are the two or three things that you do better? What bottom line impact can I expect? 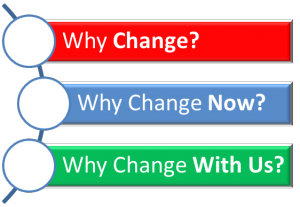 What is the ROI of making a change? Clear simple answers to these questions provide critical content when the rep has a random opportunity to engage buyer executives, knowing that most C-suite conversations are limited by available time and attention span. Flexible Case Studies provide sales reps with an edge, providing content that facilitates earlier connection with a customer. Answers to these questions can help accelerate sales decisions about whether your solution is suitable for a buyer, given their problems and their interests. In parallel, it helps to determine early whether this prospect represents a good opportunity, given their situation and their scale. There are more directed questions that arise from a case study that can help sales to identify both whether your solution is suitable for an account and whether you are talking to the right person. Understanding whether the outcomes you deliver are relevant to the individual tells you something. If the outcomes you deliver aren’t directly relevant to that individual in their organizational role, there is still useful information to gather relating to selling your solution to this account. Who are the best people to talk to in the prospect’s organization? What are the key decision-making criteria and priorities organization-wide? A Flexible Case Study can be used to qualify in several ways. Do the problems you solve resonate? All sales teams want to understand whether their solution delivers outcomes that resonate with a buyer. Using insights gathered from a broader universe of buyers is one way to have a conversation to determine what matters to an individual and potentially to a buying organization’s priorities. Do you know what matters to a specific stakeholder? If nothing you deliver resonates with the stakeholder you are talking to, then you may be wasting your time. More broadly, however, B2B buyers almost invariably make decisions by committee. Understanding which of your advantages resonate with which stakeholder can be a useful approach to selling to a buying committee once the evaluation process is underway. It can also help to steer an evaluation process through complicated buyer politics. Are you spending time on the best opportunities based on qualitative and quantitative buyer characteristics? Some opportunities are too small to spend significant sales team resources. Some opportunities are unlikely to convert based on whether buyer situations, objectives and quantitative business characteristics are aligned with what our solution delivers. A Flexible Case Study, adaptable to buyer specifics and used early in the sales cycle, can help prioritize between real opportunities and longshots. 3. Differentiate. Competing with low cost solutions in any buyer evaluation or negotiation is worth trying to avoid. Looking ahead, positioning your solution for a successful buyer evaluation process is an important early sales objective. Differentiating your solution early is critical, not just in setting up a better evaluation process, but also in getting the buyer to move forward to Evaluate. Differentiation means highlighting your distinguishing features, but also highlighting your differentiating benefits and the financial value of the outcomes your solution delivers. 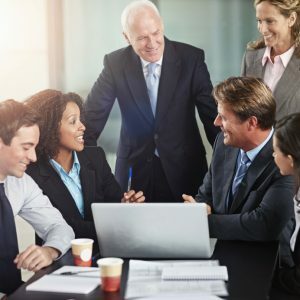 Communicating business outcomes in clear and simple terms is a way to transcend techno-speak and move sales teams beyond selling product features. A Flexible Case Study or Value Proposition used early helps to differentiate by providing clarity. Clarity on what your solution does for your customer, in itself, differentiates. 89% of buyers say they don’t engage with sales reps because they perceive that the reps’ solutions are not relevant to their company. 77% of buyers are more likely to choose a vendor if the sales person is informed about their business needs. A customer-centric case study or Value Proposition that is clear in terms of what your solution does for your customer’s business helps to overcome these barriers. Most of your competition is not addressing the account’s business outcomes or customer needs. A clear Value Proposition differentiates your sales rep from 80 to 90% of sales reps calling on the account. Clarity on why a buyer should change differentiates. The Richardson survey cited above highlights the importance of combatting the status quo. Sometimes overcoming the status quo is possible by connecting a solution to rational or irrational pain points. Often a buyer can only justify evaluating a change if he or she can make the case that there is a reasonable ROI from that change. To move a buyer forward, it usually takes some fundamental qualitative, quantitative and financial reasons. 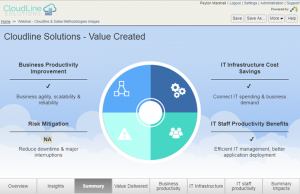 Flexible Case Studies and Value Propositions provide these reasons. Clarity on why your solution is better than the alternatives differentiates. A seller early in the sales process usually faces fundamental uncertainty about what direct competitors the buyer is considering. Positioning broad competitive differentiation often makes sense even if highlighting specific competitive advantages invites unnecessary competitive comparisons. Simple summary answers to how you are different usually makes more sense at a qualitative or summary level at this stage of the buying process than a deep dive into quantitative or financial comparisons. Knowing that they have the answers provides sales reps with the confidence that their solution is better and that its advantages justify their price points. A good Value Proposition provides broad competitive positioning and the specific ability only if needed to respond to competitive situations with quantified and financial differentiation. 4. Advance to the Next Stage. Some spreadsheet authors create Value Propositions that are unsuitable for use early in a sales cycle when the objective is to get a buyer to evaluate. Discussions of proof points and detailed math conversations complicate early stage buyer conversations. They are usually just as unnecessary as detailed technical discussions that come too soon. Good sales professionals want to provide just enough information to move the buyer to a commitment to evaluate your solution with confidence. Early in the sales cycle, the primary sales problem is navigating a buyer organization in the face of buyer uncertainties. This navigation problem usually means identifying a sponsor, mobilizer or champion. It usually means getting the right buying team assembled for an initial conversation. Get the right people engaged. Discussion of the substance of a case study or a Value Proposition is often a good reason to get broader involvement at a buying organization. By identifying what your solution delivers, a Value Proposition helps to ask the question of whose problem or opportunity that is. This helps to engage the right stakeholders, where the ultimate objective is to find a buyer sponsor, champion or mobilizer who is prepared to drive the buying process. Get the right next meeting. Presentation of a Value Proposition can be as meaningful a reason to get the right people in a room or in a web meeting as a demo or the involvement of more senior people on the sales team. Because Value Propositions highlight business outcomes, a meeting to discuss your Value Proposition doesn’t automatically restrict attendees to technical people at the buyer’s organization. Inclusion of business outcomes on the agenda of a meeting or a call is a good reason to get buyer senior management involved. 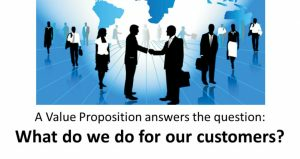 Answer the question of “why go deeper?” A Value Proposition customized later in the sales cycle represents the business case for a customer to buy your solution. Early on, a Flexible Case Study, as an emerging Value Proposition, has the fundamental answers to why a buyer should spend more time evaluating your solution. Those qualitative, quantitative and bottom-line answers should be a reason for the buyer to prioritize discussions with your sales team and to move the buying process forward. Flexible Case Studies and Value Propositions move the ball down the field. 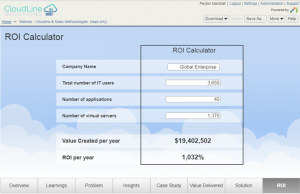 Value Propositions as Aligned, Sales-Ready Tools. The best B2B enterprises deploy Value Propositions to improve B2B sales team performance, addressing sales challenges in a way consistent with an organization’s sales training, throughout the B2B sales cycle. For account executives and sales reps, they are useful early in the sales cycle as Flexible Case Studies in call preparation, in building sales confidence, in qualifying opportunities and in engaging customer executives. For technical sales and presales professionals, joining the team in the middle of the sales process, Value Propositions provide Customer Value Analyses as an important consultative selling tool to address presales challenges. As customers decide to purchase, the Value Proposition becomes a Shared Business Case, collaboratively agreed between sales executives and customer sponsors, that serve as a buyer’s internal financial justification to purchase. It isn’t hard to start value selling. Value Propositions provide core sales content that helps sales teams communicate what your solution does for your customers. Value Propositions are a shared basis for collaboration that help sales teams win.